THE FRENCH GOVERNMENT has backed down on planned fuel tax hikes in a bid to draw the heat out of fierce protests that have escalated into the deepest crisis of Emmanuel Macron’s presidency. The concessions, coming after an earlier €500 million relief package for poorer households, mark the first time 40-year-old Macron has given ground in the face of public opposition. Prime Minister Edouard Philippe announced rollbacks on fuel taxes and electricity price increases in a rare televised address after France was rocked by intense street clashes and vandalism in Paris over the weekend. Planned tax increases on petrol and diesel on 1 January will be suspended for six months, he said, while hikes in regulated electricity and gas prices will also be frozen during the winter. Pressure has been mounting on the government after protests degenerated into the worst street clashes in central Paris in decades, leading to scores of injuries and arrests. For weeks Macron held his ground on the fuel taxes, which finance anti-pollution policies but which critics say unfairly weigh on drivers in rural and small-town France. Rescinding the January increase — three euro cents for unleaded and six cents for diesel — was a core demand of the demonstrators, alongside a higher minimum wage and the return of a wealth tax on high-earners which was abolished last year. Yet many said after Philippe’s speech that they had no intention of calling off their protests and it remains to be seen if the government’s proposals are enough to stem the protests. “Six months is nothing: They hope we’ll now go home but we’re not going to move,” said Lionel Rambeaux, 41, a welder at a blockade halting access to a fuel depot outside Le Mans in western France. The government is hoping to stave off another day of running riots and burning cars like on Saturday, when more than 400 people were arrested in the capital. “If there is another day of protests, it must be declared in advance and must take place calmly,” Philippe said. Mass street protests have repeatedly forced French presidents into U-turns, something that Macron had vowed to avoid in his quest to “transform” the French economy and state. The concessions could have implications for other planned reforms, including changes to the civil service and a major and highly controversial shake-up of the pensions system. A new poll by the Ifop-Fiducial survey group today showed the former investment banker’s approval rating at a record low of 23%. “Eventually he backed down, which is going to divide the (yellow vest) movement, but it also risks dividing his own political base,” said Jerome Sainte-Marie of the PollingVox survey group. Macron has not spoken publicly about Saturday’s destruction in Paris since his return from a G20 summit in Argentina on Sunday, and his office said Tuesday he would not comment “for the time being”. The “yellow vest” movement, named after the high-visibility jackets worn by supporters, emerged on social media in October after months of swelling anger over rising fuel prices. A centrist, Macron was elected in May 2017 on a pro-business platform that included measures inciting companies to invest to create jobs. Immediately after coming to power, he pushed through tax cuts for entrepreneurs and high-earners — an “original sin” for his critics. The “yellow vest” protests have blocked highways and fuel depots around the country, causing headaches for businesses and fuel shortages in some regions. The protests have spread to around a hundred schools nationwide, which were still partially or totally blocked today by teenagers voicing frustration over university entrance reforms. Email “French Prime Minister suspends fuel hikes in bid to end 'yellow vest' protests”. 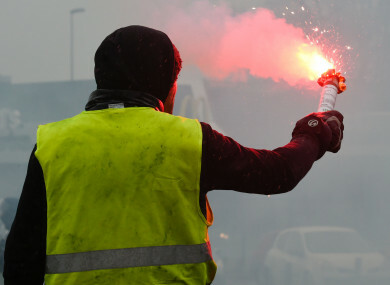 Feedback on “French Prime Minister suspends fuel hikes in bid to end 'yellow vest' protests”.